[Sticky] The Ideal Power Level for Your Gun – What Do Pellets Have to Do With It? For a long time I have been agonizing over the choice of a new gun. One important factor I kept coming back to was the question how much power I should get. The same “agony” with current guns -- When modding a PCP (or moving the power selector) -- What power level should I choose? Another important factor are the pellets/slugs I want to use. So, I started calculating (ChairGun WIN) which velocity a certain muzzle energy would produce with each of the pellets/slugs I’m interested in. And my table finally ended up in the diagram at the end of this post. Let’s assume midrange shooting (30+ yards) and beyond, since 10-yard target shooting with wadcutters is a whole different animal. (3) In order to find just the right pellet that the gun likes (best precision, smallest groups) – it is better to have more pellets to choose from rather than less. (4) To have a flatter trajectory for mid range and especially long range shooting – it is better for pellets/slugs to have a higher velocity. Also, hollow points generally have a better expansion at higher velocities. Say I wanted to have the most amount of pellets to choose from to increase the chances of finding the pellet that my gun likes. ➔ For that I go to the red numbers (muzzle energy in FPE) and find the number that is abeam of the highest amount of gray boxes and pellets to its right. In this case, 24FPE is abeam of almost all the pellet boxes (P1 through P8 = 22 pellets not counting tin­­/zinc alloy pellets). Even at 17FPE, I still have 19 pellets to choose from. Say I wanted to have the most amount of slugs to choose from to increase the chances of finding the slug that my gun likes. Note that the slug boxes have a gray portion that shows the muzzle energy for 800fps through 950fps. Separated with a red line is the white portion of the box that goes all the way down to 650fps, and which many find is too low for slugs. Here we only consider the gray part 800-950fps. ➔ If I wanted to have many slugs to choose from, but wanted to save air, or my gun isn’t that powerful, I find the red muzzle energy number 39FPE which is abeam of slug boxes S1 through S5. If I wanted to use very high power, but still have many slugs to choose from, I could go with 47FPE, which is abeam of boxes S3 through S8. Say I wanted to be able to shoot hollow points, but also shoot long distance with the gun, and therefore would like rather heavier pellets than lighter pellets (because domed heavier pellets tend to have a higher BC). *** ➔ For that I would find where the bulk of the hollow points is, and they are in boxes P3 and P4. For P3 I can go up to 33FPE, for P4 up to 36FPE. Both of these muzzle energies allow me to use even the heaviest of the pellets from P8. Now, if high power (for hunting or a flatter trajectory at longer distances) was important, I might go with the 36FPE and the three hollow points in P4, and forego the use of the five in P3. Say I’m obligated to (or choose to) shoot lead-free pellets. That means only pellets from box P1. ➔ P1 requires a muzzle energy anywhere between 11 and 24FPE. However, if I want to increase my (lead) pellet choices, a power of 24FPE will give me access to almost all pellets listed here. Say my gun has a muzzle energy of 40FPE. ➔ Going from the red 40 to the right, I see that this limits my choices to the pellets in boxes P6 through P9 (=8 pellets total). Going to the left, I see I can use the slugs in boxes S2 through S5. ● For at least a mediocre level of wind drift resistance and energy retention at the target (hunting!) – this diagram only has pellets with at least a BC of 0.020 (source of BC, cf. ***). ● For better precision/ accuracy – this diagram only has pellets from established high quality brands. H&N is rebranded as: SIG Sauer, Remington, Stoeger, and there are at least 9 rebranded H&N Baracuda’s – quite a fish pond! Crosman is rebranded as: Brocock, SILCO, Webley. JSB is rebranded as: Air Arms, Cometa, FX, Hatsan, etc. ● For the sake of comparison the power of a particular gun is assumed to be the same for all pellets/slugs. Of course, that is usually not true, differences of 2 to 4FPE are quite common, even 5 and 10FPE in more extreme cases. And springers often develop higher power with lighter pellets, and PCPs with heavier pellets. ● This diagram includes representative commercial AG slug brands: NSA (Nielsen Specialty Ammo), and H&N (shown at IWA 2019). Slugs written in gray have shown poor precision in many barrels not made for slugs. 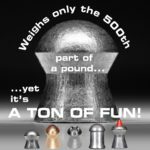 | MrHollowPoint offers the following weights: 26, 28, 30, 35, 38, 40, 45, 46, 50, 51gr. That took a great deal of time and follow through. And beyond that, the table is very well thought out. I can greatly appreciate the coordinating colors. It adds another level of logic and appeals to my senses. There is a lot going on within the data and there is just so much information that there is no easy way to relate it; but, as I use it, it becomes more significant. Thank you for your efforts and contributing a great tool for us all. That looks like it took you some time to compile that data. Thanks!